Light Moisturisers That Are Super Hydrating But Wont Leave You Oily. The warm weather has been coming here in the UK and hopefully it will be here to stay. There's only one problem with the warm weather, my skin can turn super oily looking very quickly. Even though I have dehydrated skin this is an issue in the summer. And my love for a super dewy finish mixed with the heat can leave me looking like a melted wax doll. I tend to find opting for lighter moisturiser tends to help this issue. But because my skin is dehydrated I still need the hydration. It's a vicious circle! I have found a few that are light, hydrating and that don't leave me oily. So here they are. This has quickly become one of my favourite moisturisers. This is so light but so hydrating! It contains all natural ingredients that really perform in terms of hydration. It has a super light consistency that absorbs really quickly into the skin. Leaving it soft, smooth and hydrated all day! 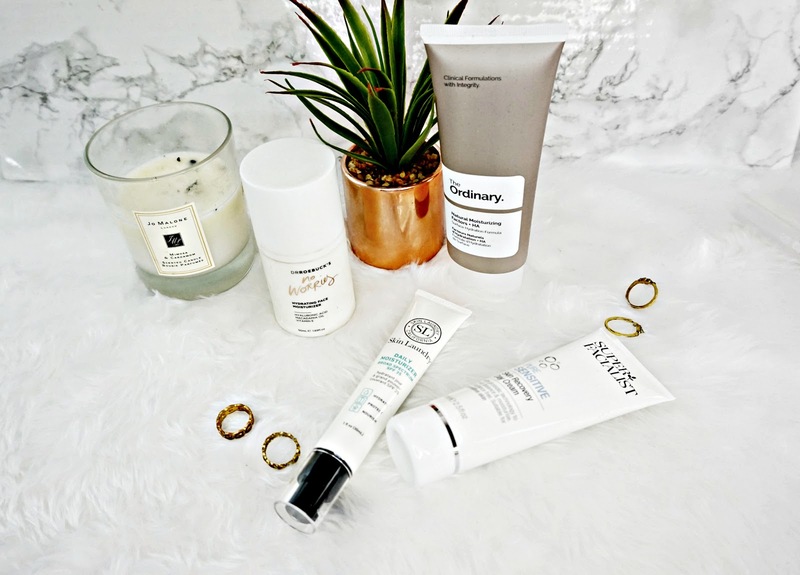 Even though I have dehydrated skin I do find in the summer I tend to get oily around the T-Zone, especially if I've applied loads of hydrating skincare. But with this moisturiser it doesn't really happen. But skin is still hydrated all day. This actually works really well as part of my evening skincare routine too. It's a good solid all rounder. Another moisturiser that really keeps my skin hydrated without making it oily is this offering from The Ordinary. This one contains hydrating ingredients that are naturally found in the skin like Amino acids and fatty acids. This has a strange consistency that almost feels bitty to touch, but it melts into the skin really well. Leaving it really hydrated without any greasy-ness. It keeps my skin hydrated all day long too. For the price this is amazing! This is one of my favourite day creams that tackles my dry skin. The name did make me think this would be quite thick and nourishing, that it would work better at night. But this is surprisingly light! So light it doesn't feel heavy or leave a sheen on my face. But it's still hydrating enough, my skin never feels dry or tight throughout the day when I use it. It's also formulated for sensitive skin types, it doesn't have an odour nor has it caused me to break out. It's the perfect day cream throughout the summer months. If you want a moisturiser that is going to make you matte, without any shine at all this is the moisturiser for you. It melts into the skin leaving it so smooth, it actually reminds me of primer because of the way it makes my skin feel, but this still hydrates it. This offering also has SPF15 so it's perfect for holidays or travelling. I got this from the Skin Laundry Travel Set available here. So there's of few of my favourite super hydrating moisturisers that aren't oily.